Touch started in Hong Kong in 1988, with under 200 members and a single tournament, the Summer Touch Tournament. The Hong Kong Touch Association (HKTA) was formed in 2003 to help administer and organise the sport in Hong Kong, and it is a member of the Federation of International Touch (FIT). The HKTA is a Registered Society, holds a Business Registration, and is based at the offices of the Hong Kong Rugby Union in Olympic House. The HKTA Committee, made up of volunteers from the Touch community, oversees the sport, and the HKRU employ one full time Touch Manager, as well as providing development support through the auspices of their Community Department. While Touch is recognised and supported as an independent sport, at schools level it makes sense to share resources between HKRU and HKTA as touch is the best game that can be introduced on hard court surfaces. 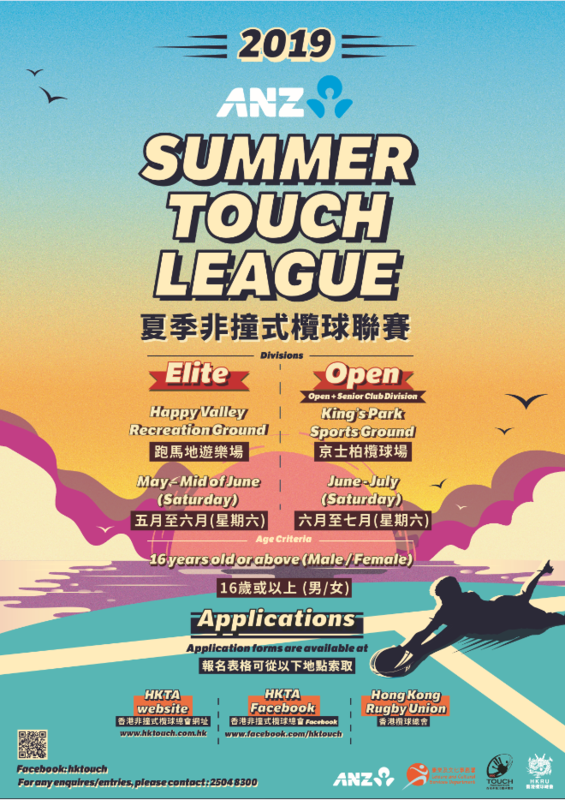 There are also a number of stand-alone Touch tournaments during the year either organised or supported by HKTA including Summer Indoor Tournament, Winter Indoor Tournament, Swire Properties Corporate Touch, Disciplined Services Tournament, and the Revolution Tournament. There are also a wide range of youth tournaments jointly organised by HKTA and HKRU, including the Primary Schools Tournament, Secondary Schools Tournament, and Tertiary Tournament. HKTA runs an annual Beginners Course together with Governments Leisure & Cultural Services Department in November February with average of 100 participants. HKTA runs an annual programme with Yuen Long and Tsuen Wan District Sports Associations targeting local primary schools. A Hong Kong Representative Touch Team has toured to New Zealand, Korea and China in recent years, and also played a series against Singapore. The HKTA is committed to not just develop Touch in Hong Kong, but also assist in developing the sport around the region, particularly in China. The HKTA is working hard to grow both the quantity and quality of referees in Hong Kong, and also support coach development, utilising the kind support of FIT and the experience of match officials from countries like Australia and New Zealand. Should there be any bad weather conditions on the Competition and Tournament day, which will affect the competition, the Tournament will be cancelled as per the following conditions. If there is Typhoon Signal No. 3 or above, and Red or Black Rain Warning hoisted by the HK Observatory, the Tournament will be CANCELLED. When the Thunderstorm warning is hoisted by the HK Observatory before or during the Competition or Tournament the decision as to whether a competition will be postponed or cancelled will be made by the Tournament Organizer and Referee Manager. For further information relating to the weather conditions on a Tournament day, please call 2504 8338 at 11:00a.m. onwards to check for the Tournament status. Please note the HKTA will inform all Team Captains of cancellation of the Tournament on any given weekend by text message as soon as we are made aware (usually by Saturday 11am) and will also publish this information on the HKTA’s Facebook page.